On 19-20 November 2018, the Challenge Accepted! 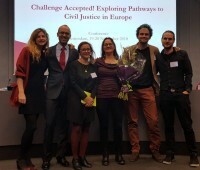 Exploring Pathways to Civil Justice in Europe was held at the Erasmus School of Law. It was the second big event within our ERC consolidator project ‘Building EU Civil Justice’. With keynotes from Ruth de Bock (AG Supreme Court, NL) and Judith Resnik (Yale Law School, USA) and 4 panels with a total 17 speakers from the Netherlands, UK, Italy, Canada, France, Germany and Belgium (see the seminar flyer) the conference covered many issues surrounding civil justice innovations, including specialization of courts and judges, self-representation and the future of lawyers, the transformation of civil justice through the use of Artificial Intelligence (AI), and the practice of ADR/ODR schemes in different European countries. With the broad variety of panelists as well as participants the conference managed to capture current and future issues in the ongoing transformation of civil justice around the world. With the conundrum of the ethical use of AI in adjudication, the general reduction in subsidized legal aid and the changing and often diminishing role for lawyers, the seemingly ever-expanding options for out-of-court and online dispute resolution schemes as well as current establishments of specialized international business courts, the discussions during the conference made clear just how timely questions about the current and future state of civil justice are. Approximately 100 participants, including judges, practicing lawyers, academics, policy makers and business representatives, actively took part in the discussions. These discussions continued during the drinks and lunch where four selected PhD candidates presented their poster on a topic relating to civil justice issues. Papers authored by the speakers and panelists will be published in an edited volume in 2019. The seminar was organized by Erasmus School of Law (ERC project ‘Building EU Civil Justice’) of Erasmus University Rotterdam, with funding from the European Research Council.